As writers and editors, we at ParentMap often comment that today’s parents want the very best for their kids — in education, social smarts, emotional intelligence and more. And why not? These are our children we’re talkin’ about! That’s why ParentMap wants to highlight your top choices for resources, camps and classes, shopping, and food and dining, along with additional activities and options for kids in our area. Your votes and comments tell us you care (passionately!) about the services and businesses you frequent. You are loyal, enthusiastic and downright emphatic (“They have everything! It’s the most fun store ever!” a reader enthuses about a toy store), and truly love to patronize these spots. Why? The recurrent theme: You appreciate high-quality, helpful staff, and programs and vendors that value families. We are happy to present our 2013 Golden Teddy Award winners. 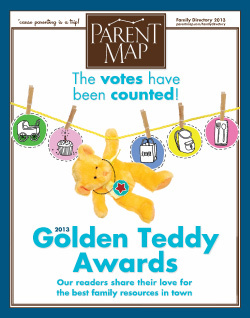 Dive into the categories below to read the full results of the 2013 Golden Teddy Awards, or flip through the Golden Teddy Awards/Family Directory print issue online. See the Golden Teddy Award winners and finalists for 2011 and 2012.